pollution will have to be used instead. journal Environmental Science and Technology. create a leak free tank. ice charts from the National Ice Center. of several mild winters before. widely. Global warming has to be measured in decades. Pilot Program to Help Protect Food Supply? States record the number of livestock and the amount of grain grown in each county. But it’s not clear which farms are raising the meat and produce. As a food security measure some states want to keep track of animal and produce movement. In Illinois, Department of Agriculture Director Chuck Hartke says a satellite tracking system will allow the state to pinpoint food producers, grain elevators, food processing facilities and distributors as well. A computer program will allow the state to develop disaster plans. That will help the state deal with terrorism, diseases such as mad cow and natural disasters. If the one-county pilot program works, the project will be extended statewide in Illinois. Other Great Lakes states are looking at similar programs and trading notes on what works. For the Great Lakes Radio Consortium I’m Maria Hickey. A new program is using satellite transmitters to learn more about the migration patterns of loons. from New York state make their way south, carrying satellite transmitters. 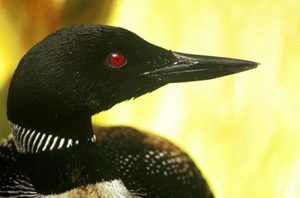 researchers understand and protect loon habitat across the country. Things such as acid rain, oil spills or a recent botulism outbreak in the Great Lakes. that help the loon population survive. extractions of water from lakes, streams and underground wells. “In fact, it’s an embarrassment for this state that we have not adopted a water protection statute. a commodity available for export outside the region. studies State of the Union speeches. He says that’s not typical. the State of the Union agendas for both parties. plans, no mention of the environment says a lot about President Bush’s priorities. Ugly Bikes a Better Alternative to Cars? bikes look. That’s unless they’re not ugly enough. a bright canary yellow – really ugly. stick out, but not in a good way. Tim Potter says, the less desirable the better. polluting way to get across campus. departments and signed out for daily use. the bitter cold of winter and the dead heat of summer. since Gosselin brought the idea back from Canada. Similar programs have sprung up across North America. such as Portland, Oregon, and St. Paul, Minnesota. were community bike programs all across Europe. their bikes. Amsterdam and Copenhagen use white. Use a bike when you can avoid using a car. Red Bike Project is approaching its sixth birthday. 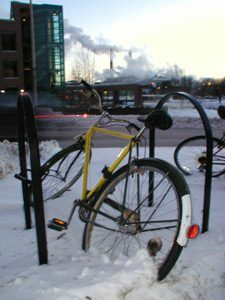 to donate free recycled bikes to the city of Madison. Now the bikes are in for their winter repairs. University of Wisconsin students drive the program. for a community bike project. outside the city and abandon them. So, he had to make riders put a deposit on their bike. But there are 400,000 people in the Madison area. pedestrian numbers to consider a success. they would be happy to have 100 bikes by spring. he drove to Detroit to sit in one at the auto show. hybrids on the market so far have been small cars like the Prius and the Honda Civic. snowstorm to come to the auto show, and was checking one out. and its luxury division Lexus will offer its own model. the bucket compared to the almost 16-million vehicles sold in the U.S. last year. on imported oil – if enough people can be persuaded to buy the vehicles. others will too, if the price is right and they prove to be reliable. standard gasoline-engine Escape and the company’s larger Explorer SUV. Environmental groups see promise in the plans laid out by Canadian prime minister Paul Martin. Protocol. And he’s put a new emphasis on funding for cities. could be a good deal for the environment.